Life can be a bit like a rollercoaster ride: ups, downs, fast, slow, exciting & scary… sometimes all at once! Yoga for Life Balance offers practices to help maintain equanimity and mindfulness through the every day physical, mental and emotional twists and turns. Stress is an integral part of daily living and a natural response to help us survive. However, our response to the stressors of life can determine how they affect our minds and bodies. Left unchecked, high levels of stress can lead to many common health issues such as anxiety, depression, high blood pressure, body aches, and fatigue to name a few. Join in Monday evenings for a yoga class to help purify and balance the energies of body and mind. Foundational hatha yoga practices of physical postures, breathing techniques and concentration methods will be explored to deepen awareness as well as bring more balance, joy and harmony on the mat and into every day life situations. Yoga for Life Balance will help to re-balance, re-store and re-member all aspects of your “self” and allow participants to leave feeling more relaxed, rejuvenated, and ready cope with this rollercoaster called life. 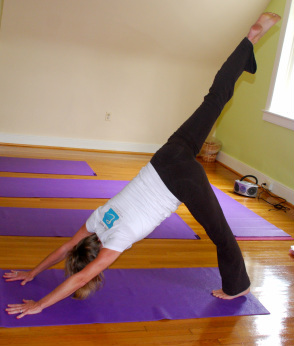 Stay after yoga class or join in separately for a half hour of “yogic sleep”. This 25-minute practice is a powerful technique in which you learn to relax consciously. Yoga Nidra is a systematic method for inducing complete physical, mental and emotional relaxation. The practice is done lying down or seated, so that the physical body is stilled and the only awareness is to the verbal instructions given to draw the mind from the external sensory perceptions into the internal experience. This is an excellent practice for reducing health issues such as anxiety and hypertension while increasing mental clarity and concentration. All classes are session based. Each session is 8 weeks in length. The Foundations A & B sessions are rotational in nature. They do not have to be completed sequentially. It is highly suggested that students commit to a full session as the course material within sessions is sequential in nature. Drop-ins are permitted with prior authorization from the teacher. $120 for the 8-week session.